Cigars On The Porch: Oh. Mah. Gahd. Indoor heat is the best thing evah. Our house now looks like a cruise ship. I'm half-expecting it to start moving down the block, a la the Crimson Permanent Assurance skit. 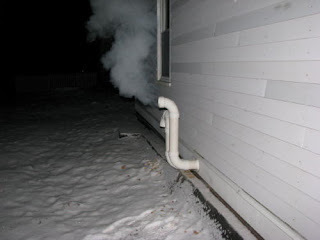 This is the steam being released from the boiler thingy. Technical term. 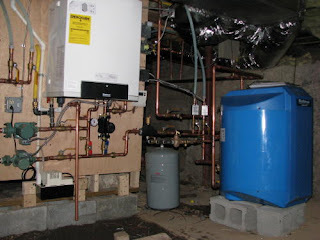 And here is our new boiler setup in the basement. Boiler on the left, water tank on the right, and air handler suspended in the rafters. Way cool. If you'd ever been down in our basement before (icky, spidery, dirty, dark - one must assume a dead body is buried down there), you'd know that this was a vast improvement. Our attic now looks like it's been invaded by the Planet Aluminum Foil. Those are our new ducts. They used to be on the floor (trip hazards, the whole lot of them) and uninsulated (brrrrrrr). Of course, there were some tiny concessions to be made for staying warm. We have some slight cosmetic work to do in the almost-done-new-bathroom. I can totally work with that, though. 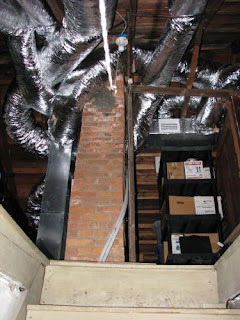 That duct snaking above the master toilet now supplies the guest bathroom with warm air. Before, it had come from the basement, close to an exterior wall, then barely leaked out a lukewarm breeze by the time it made it to that bathroom. Makes for a cold toilet seat. So, yes. We're loving life. All weekend long we've been startled by warm air coming out of vents all over the house. The cats are happy that we finally stopped torturing them with the cold air, and we're happy to be able to sit at the computer for more than ten minutes without our fingers turning blue. 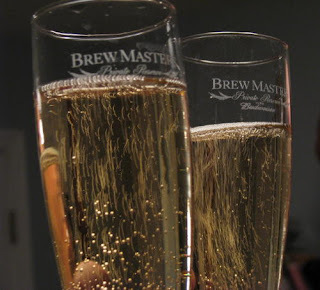 And yes, Joe and I are nothing if not classy with a capital K. We toasted our first warm night with champagne. In beer glasses. We had a lovely weekend of attending the grand opening of our new senior center, doing a bunch of local shopping, and watching Superbad. That movie seriously had me snarfing my beer out of my nose. I heart Seth Rogen. 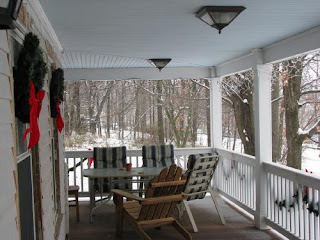 warm + cold air outside = better. 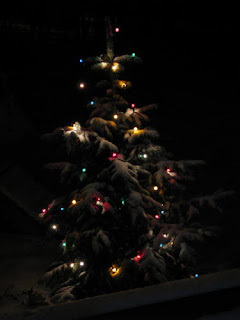 warm + cold air outside + snow on the ground = great! Yay! So glad you've gotten that beast taken care of. I might worry, though, if that foil monster comes alive! Haha! I think it looks like something out of a 60's sci-fi movie! Oh, I'm so happy for you. I hate being cold. 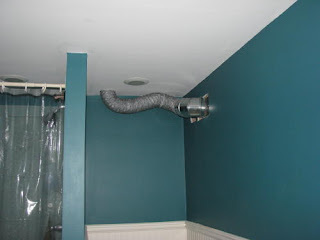 But HOW will you disguise the duct running through your master bathroom? I am so curious! And what, exactly, is a boiler? I've never really known... I guess I'll go look it up.